In the current issue of Public Administration Quarterly, Chester Robinson and Gloria Billingsley discuss my 2013 monograph Large Forces: What’s Missing in Public Administration: “Many problems on the public policy agenda reflect environmental factors, including political, economic, shifts in populations from farms to cities, and social conventions, some of which our society and leaders are not eager to take on. Alasdair Roberts, and other organic theorists, see the country’s policy decisions as being buffered by these powerful forces. To them, it seems impossible to fully understand the actions of government without studying the large forces that caused the problem to come into being. What government does, and how it does it, cannot be explained without accounting for the pressure applied by these forces. Large forces scholarship helps us to produce rigorous, persuasive and contextual answers to public policy issues.” Read their article. 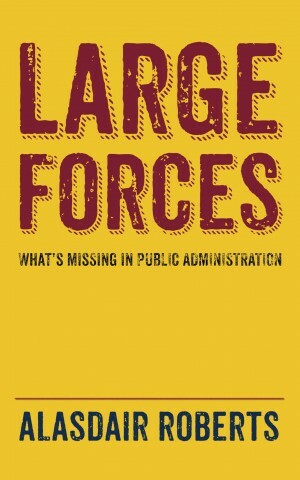 On Baidu.com, Lihua Fang discusses my 2013 monograph, Large Forces: What’s Missing in Public Administration. Read Fang’s comment in Chinese. Read the Google translation. I participated in the special session, “Is public management neglecting the state?”, at the 2016 Public Management Research Conference at Aarhus University on June 24. The paper prepared by panelists can be downloaded here. The introduction to a symposium in the current issue of the Journal of Public Affairs Education makes reference to my monograph, Large Forces. Read the introduction. Large Forces can be obtained in electronic and print format on Amazon. My work on Large Forces is discussed in an article just published in the American Review of Public Administration. “But equally in need of buttressing [in American public administration] are the macrodynamic foundations of public administration,” write Robert Durant and David Rosenbloom. “As Alasdair Roberts has argued, although public administration is typically conceived today as a battle for ascendancy between Dwight Waldo and Herbert Simon, a third—largely abandoned—tradition studying the macrodynamics of public administration existed in the work of Leonard D. White. White’s four-volume study of the evolution of administration in the United States placed each administrative era’s focus within a larger ‘macrodynamic’ cultural, economic, technological, philosophical, and political context, much as earlier scholars had done.” Read the article. Professor Per Laegreid discusses my monograph Large Forces in an article just published by JPART: “There is a need for public administration to go back to its roots to address the big issues that contemporary political systems have to deal with such as climate change, migration, demographic and technological changes, and security. We have to go beyond the internal management problems and address the wicked issues that societies are currently facing in explaining the path of administration. This is an issue throughout public administration as a discipline.” Go to the article. My article “The nation-state: Not dead yet” has just been published by Wilson Quarterly. A version of this article was also published in French in Perspectives Libres in April. In a new volume from Routledge, Public Administration Evolving, Richard Stillman calls Large Forces: What’s Missing in Public Administration a “challenging polemic” in the field. More details about Large Forces here. I’ve just posted a short paper on SSRN, “The Nation-State: Not Dead Yet.” It marks twenty years since the publication of several influential books (by Kenichi Ohmae, Jean-Marie Guéhenno, and Susan Strange) that predicted the end of the nation-state. I’ll be discussing my monograph, Large Forces: What’s Missing in Public Administration, at George Mason University’s School of Policy, Government and International Affairs on December 2. Details about the lecture here.